George Billis Gallery is pleased to present the gallery’s first solo exhibition of work by Monroe Hodder. 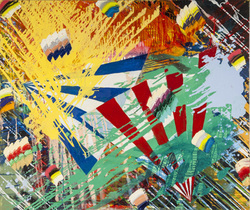 The exhibition features the artist’s newest body of abstract oil paintings bursting with color and vibrancy. The show continues through January 4th, 2014. The artist writes of her work: “Layers in a painting interest me because of the rich undercurrents they bring. I like to begin with a radiant field of color and overlay this base with transparent clouds of paint and grids of skewed geometry. This structure serves as a platform for representational imagery, often from art history. I finish the painting with an expressionist display, a spontaneous explosion of paint wrinkles, smears, dabs and zigzags. Monroe Hodder received her MFA in 1983 from the San Francisco Art Institute and has been exhibiting widely across the U.S. and the U.K. She has been featured in many publications including the San Francisco Chronicle, Wall Street International, and Home & Garden magazine to name a few. Her work has been collected by museums, corporate and private collections which include Denver Contemporary Art Museum, Portland Museum of Art, Bank of America, Tom Cruise, and the Coudert Brothers. Hodder lives and works in New York City.